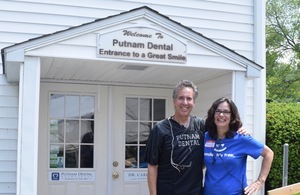 Over 60 patients came out on a hot, muggy afternoon this past Saturday June 2nd to take advantage of Putnam Dental Associates free "Dentistry From The Heart" event. Dr. Carl Ern and his staff have donated their time and services to members of the community who have inadequate or no dental insurance. Dr Ern saw a need for this over 7 years ago and has been holding the event every year with the assistance of his staff of highly trained dentists, dental assistants and office personnel. There was a carnival type atmosphere in the parking lot as patients were treated to live music and food while they waited. According to Dr Ern's staff, the doctors performed 100 procedures on 58 patients that should have cost $20,914. 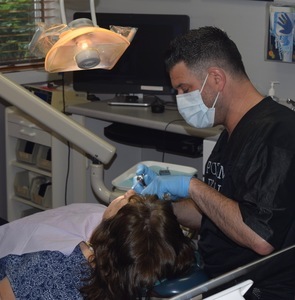 Two patients who needed more specialized treatment were referred to Dr Cuomo of Northeast Implant and Oral Surgery in Carmel who agreed to perform the work for free as well. Putnam Dental Associates is located 2435 US Route 6 in Brewster, NY. Happy Life Animal Rescue of Patterson also had puppies at the event and 6 were adopted by local citizens. To see more pictures of the days activities visit the Brewster HamletHub Facebook Album for the event. Photo credit: Peter Carey, Brewster HamletHub editor.